Designing for resiliency made the Cincinnati park's structures safer and the flood cleanup easier. USGBC Ohio is impressed by the way that Smale Riverfront Park, in Cincinnati, Ohio, has successfully demonstrated resiliency strategies. Among LEED v4 credits are three integrative process pilot credits that relate specifically to resilient design and can be of use to localities wishing to create sustainable public spaces: Assessment and Planning for Resilience, Design for Enhanced Resilience, and Passive Survivability and Functionality During Emergencies. These credits are intended to ensure the design team is aware of vulnerabilities and addresses the most significant risks in the project design. The Cincinnati Park Board’s Waterfront Team monitors the level of the Ohio River each day. 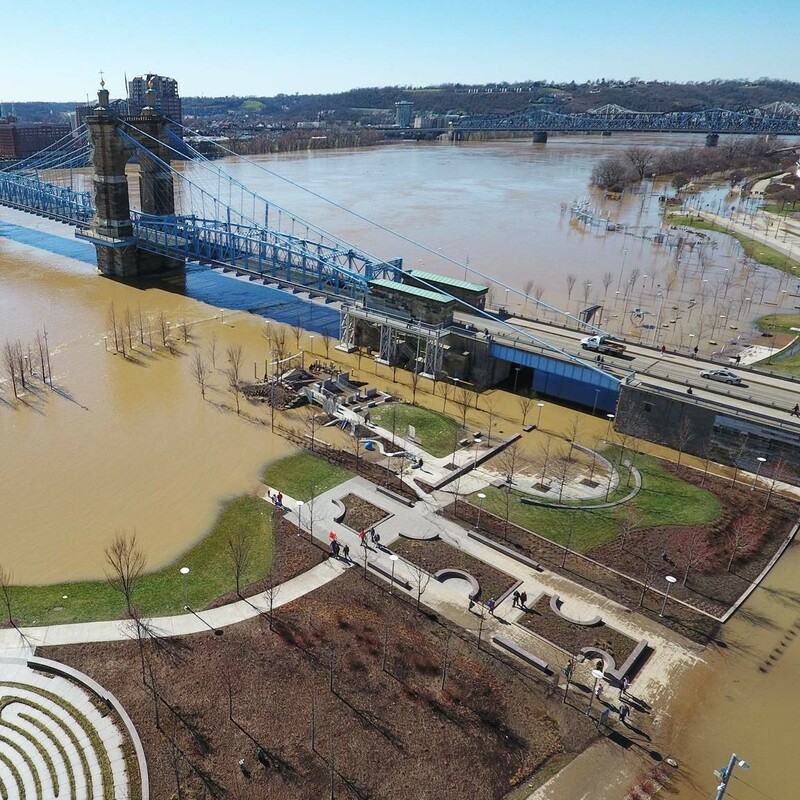 The team had just five days’ notice to prepare when, this past February, the river crested at over 60 feet, causing significant flooding in Smale Riverfront Park. The 45-acre park, designed in collaboration by Sasaki and KZF Design, encompasses outdoor recreation areas including play areas, splash grounds, picnic areas and the Carol Ann’s Carousel building. The Parks Board had recognized that any post-flood activity would require extensive cleanup and refinishing of all affected spaces. For this reason, the multidisciplinary team examined mitigation strategies to increase the resiliency of the site and building components. In the event of a flood, the waterfront team has a lengthy to-do list, including installing sandbags and removing equipment. Various recreational features were designed to be hauled off-site, including a set of restrooms constructed on a trailer to be wheeled away, but the Carol Ann’s Carousel building remains, designed to allow floodwater to enter the building and recede at its own rate. As dry flood-proofing the entire facility of the Carol Ann’s Carousel building proved infeasible, the building was located as far north out of the floodplain as possible during the master planning of the park. Flood damage is kept to a minimum through the use of selected materials, and no loose materials are located within the building that could be swept away. As opposed to drywall, all partitions on the lower levels were constructed of concrete masonry units, with a Portland cement smooth-coat finish in public areas. Mechanical and electrical equipment facilities were designed to prevent water from entering and accumulating within the components during flood conditions. This concern was addressed by hanging mechanical equipment from the slab above and designing other systems to be removable during a flood. There is, however, mechanical and electrical equipment too large to be suspended or relocated; this equipment has been enclosed in sealed rooms designed to resist floodwaters. The sealed rooms are reinforced with additional rebar, as needed, to resist the lateral load introduced by rising floodwaters, and the walls have a waterproof membrane applied to the surface. Floor drains have back-check valves to prevent water from coming back into the room, and, as a precautionary measure, sump pumps were incorporated into the design. With the river now receded back to standard levels, the Cincinnati Parks team completes the cleanup to Smale Riverfront Park—reinstalling the recreational equipment, pressure-washing surfaces and catching and releasing stranded fish from the Great Lawn. Designed with resilience in mind, the recreational features and the Carol Ann’s Carousel building will be brought back to order with the aid of floodproofing design measures.